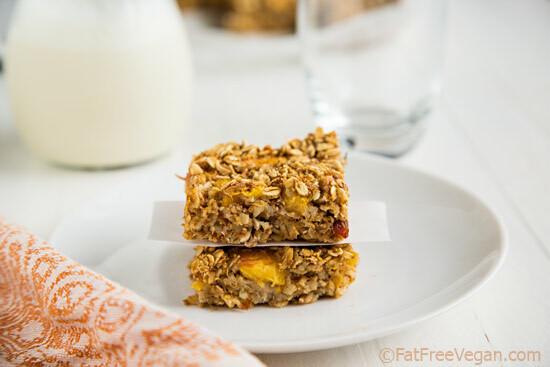 These moist peach oatmeal bars are perfect for breakfast or for a healthy dessert. Vegan and no added sugar or fat! Something came over my daughter and me at the local produce stand. Juicy Alabama peaches piled high in baskets cast a spell on us, and we wound up buying way too many, considering we were leaving on vacation in just a few days. So, in an effort to leave no fruit behind, the whole family feasted on peaches at (and between) every meal. Still, the day before we were to leave, two succulent, ripe fruits were left, but by that time, we were all peached out. I could have frozen them, but instead I decided to transform them into bars that we could take along with us on the plane. 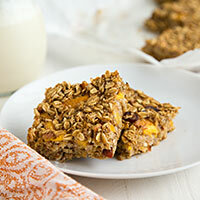 As it turned out, these moist and fruity bars never made it to the plane. They never even made it to the next day because somehow the peach magic spell was still at work, and bar by bar, the plate grew emptier as the day went by. Good thing they were low in sugar and fat because they turned out to be irresistible. Lining the pan with parchment paper makes the bars easy to lift out. These are soft, chewy bars, not hard and crunchy like granola bars, so if you plan to take them along on your next trip, be sure you carry them in something sturdy, like a BPA-free plastic storage container. They’re equally delicious as a breakfast or as a dessert–if you can keep them around that long! 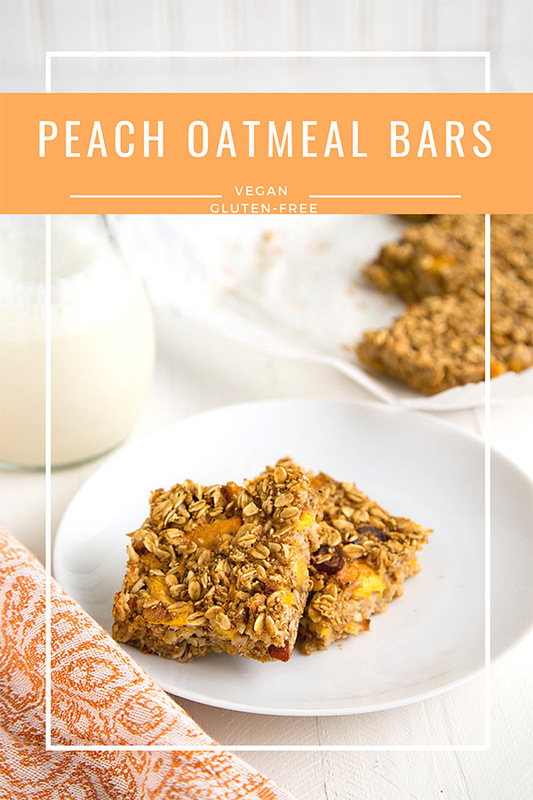 These moist bars will work with any juicy fruit, so feel free to substitute if you don’t have peaches. Add stevia to taste or leave it out if you like your bars less sweet. If gluten is a concern, make sure your oats are certified gluten-free or perhaps experiment with quinoa flakes. Preheat oven to 350F. 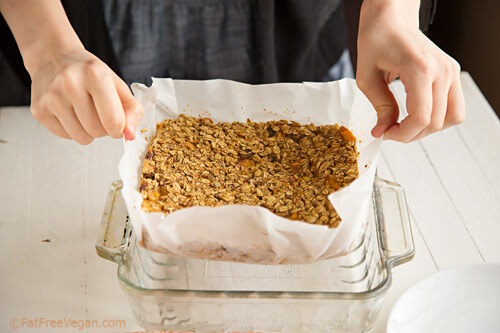 Line a 8×8- or 9×9-inch baking pan with parchment paper (this makes sure they don’t stick and makes clean-up a breeze). Combine dry ingredients (oats through stevia) in a large bowl. In a medium bowl, combine remaining ingredients. Stir the wet ingredients into the dry, making sure that they are thoroughly combined. Spread into prepared pan. Bake for about 25 minutes. If you’d like a crunchier top, put the pan under the broiler for a minute or two, watching carefully to make sure they don’t burn. Remove from oven and allow to cool for at least 15 minutes. Remove from pan by lifting up parchment paper. Cut into 9 squares and enjoy. One bar made with plain unsweetened soy milk (instead of vanilla) is 3 Smart points on Weight Watchers Freestyle program. Note to self do not make at these at an early hour without having my cup of coffee first… so I miss read the measurement for the non dairy ingredient. instead of 3/4 cup I put 2 cups of Hemp Milk. LOL. The oat meal and chia seeds expanded so some of it was absorb…I also patted with a paper towel before putting them in the oven. Despite this mishap I am enjoying the aroma of sweetness from the cinnamon, dates and peach. In about 15 min or so I get to taste. Thank you for sharing such a lovely recipe one I am certain will be added to my recipe box. But now I am looking around here because I want to go lowfat highcarb, as in McDougalls the starch solution. I think that is sort of what you are doing as well? If not, you can just discard my mail. I think the quick oats should be fine. For the liquid, try using only 1/2 cup and then add it a little at a time until you get a thick batter because you’re right that you might not need as much. Good luck! i used quick oats..and ended up using 3/4 cup soy milk + 1 tablespoon. 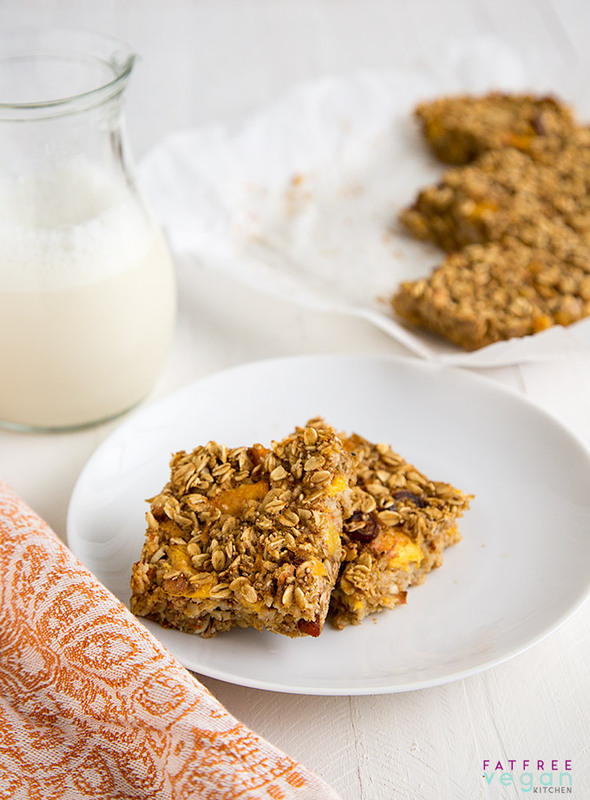 These oatmeal bars are SOOOOO good. im going to make them every week, and take them to work when I’m on the run! These are so delish!. I use a Tlbs. of brown sugar instead of stevia. What do you use to store them in the frige? Is wax paper good to use in a dish with a tight fitting lid? Thanks! I think wax paper would work perfectly. Glad you liked them! Sharon, you could try drizzling them with maple syrup or agave, if you use it. When you count those people who madly deeply is in love with peaches….please don’t forget to count me in…..especially when it comes in bars……thank you for this lovely recipe!! Holy smokes these are AMAZING!! I just whipped up a batch (no nuts or sweeteners, and chia seeds instead of flax) and they are crazy good!! I’ve tried so many recipes like this and they turn out disasterous, but this recipe is perfect. I will definitely be using it as my go-to from now on! !